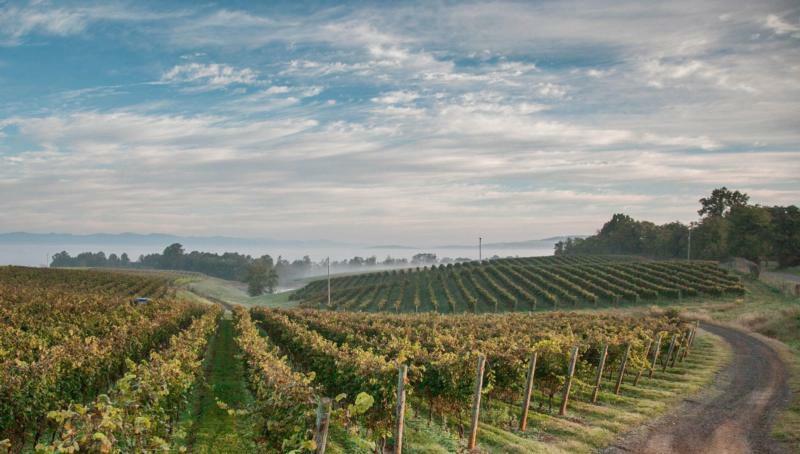 Situated on the broad, rolling plateau and foothills of the Southwest Mountains in the Virginia Piedmont, running parallel with the Blue Ridge to the west, our 900 acres occupy soils of varying mixes of clay and alluvial calcareous deposits, with sloping exposures of even greater variety. In the temperate mid-Atlantic weather of our growing region, this estate presents the viticulturist with a dynamic mosaic of growing conditions. Some years favor one planting site for a given varietal, such as Cabernet Franc, and other years favor another in the same varietal. The resulting engagement with the vines is exceptionally active and verifies the truism that the human hand, learned, seasoned, and schooled by many previous vintages, must be incorporated in any conception of "terroir."